BASEHOR — On the wall directly behind the altar in the beautiful adoration chapel of Holy Angels Parish here are two panels depicting the Annunciation. One panel features the Angel Gabriel poised in his announcement; the other portrays Mary as she affirms the will of God with her great amen. In between these two panels stands the tabernacle, with the sacred host exposed for eucharistic adoration. In its utter beauty and simplicity, this triptych represents several profound mysteries and beliefs of our Catholic faith. The March 25 observance of the Annunciation presents the ideal opportunity to reflect on ways this feast day is foundational to Christianity and Catholicism. God sends an angelic messenger to a young woman in a town named Nazareth and, boom, the trajectory of salvation history fast forwards at a rapid pace. Initially troubled and unaware of what’s transpiring, Mary listens as Gabriel tells her that the Lord is with her and that she has found favor with God. The message continues with the startling news that through the power of the Holy Spirit this young virgin will bear the Son of God, of whose “kingdom there will be no end” (Lk 1:33). Instead of prompting an existential meltdown, this announcement evokes Mary’s affirmation of trust in the word of God and her consent. The outcome is earthshaking: “The Word became flesh and made his dwelling among us, and we saw his glory” (Jn 1:14ab). God chooses to become human. The Holy Spirit intervenes. Divine love births the Incarnation. Jesus enters our world. Mary carries all of these wonders — the good, the puzzling and the sorrowful in her motherly heart. In his public life, Jesus comes to be known by his actions. He is a learned teacher, a person of compassion, a worker of miracles. He is also countercultural; he rocks the boat even as he calms troubled waters. Preceding his death, he institutes the sacrament of the Eucharist. Just as he gives totally of himself to others in life and just as he sacrifices himself in death, Jesus transforms bread and wine into his body and blood as a living memorial of his everlasting love. 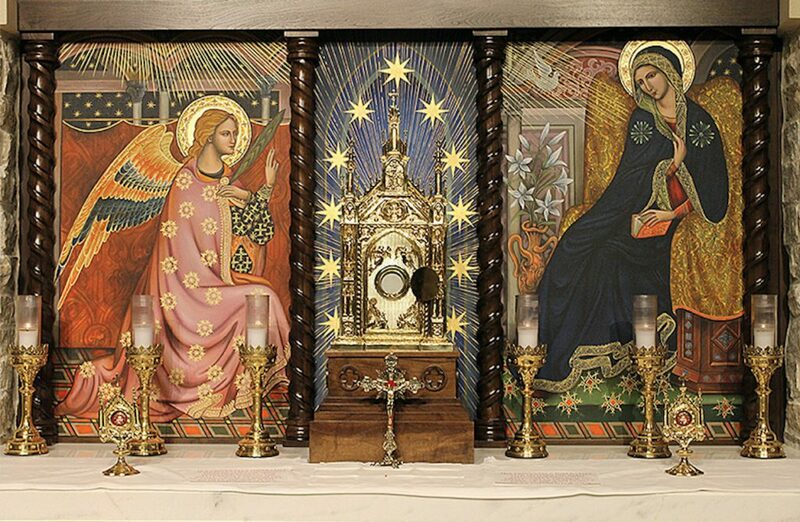 The adoration chapel triptych — with the tabernacle positioned between the Angel Gabriel and the Blessed Mother-to-be — visually connects Annunciation, Incarnation and Eucharist. It embodies the Word and the Sacrament most holy. It speaks of love and grace divinely bestowed, generously shared and eternally granted — ours for the asking; ours for the accepting; ours for the receiving. Therese Horvat is a parishioner of Holy Angels Parish, Basehor.